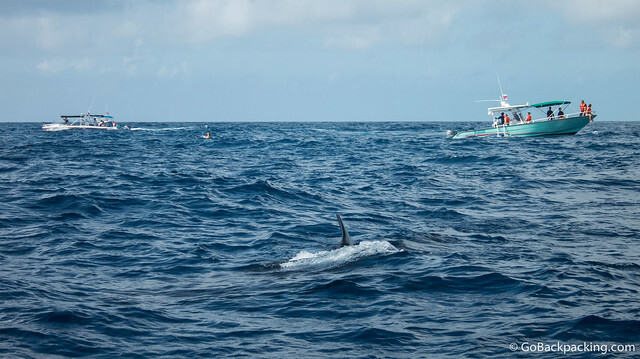 “Go now,” the guide shouts, as a large black dorsal fin begins gliding past our boat, bobbing in the open sea. I hit the water feet first, followed quickly by the rest of my body. My head dips below the water's surface from the momentum. A life jacket ensures I immediately bounce back up. 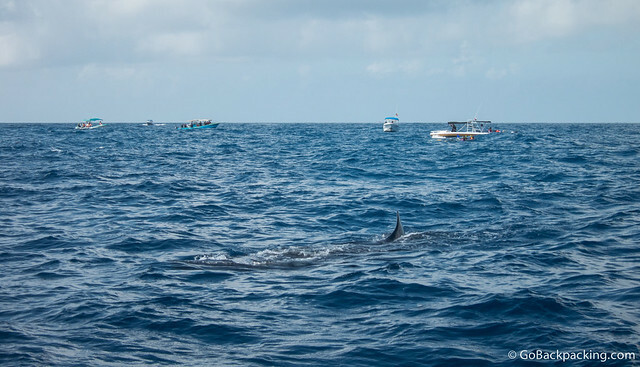 Adjusting my snorkel mask, I go face down just in time to see the white-speckled body of a whale shark, the world's largest fish, pass before my eyes. Remembering the guide's instructions, I begin swimming next to it, against the current, before it passes effortlessly into the distance. My first attempt at snorkeling beside these graceful creatures on my whale shark adventure was over in a matter of minutes. The guide in the water signals for me to return to the boat, and wait for my next turn. Our boat has nine passengers, and two guides. 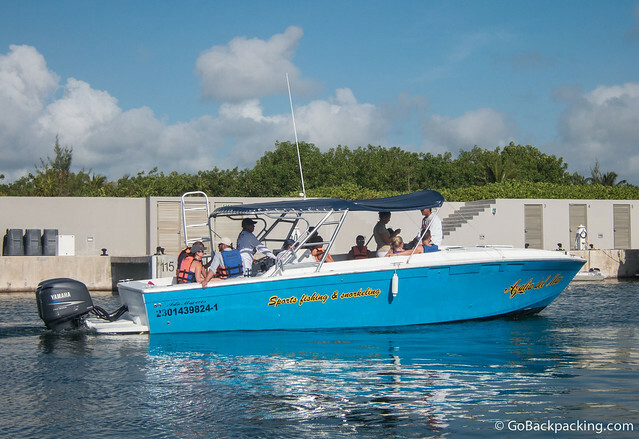 Each guide takes turns snorkeling with two passengers at a time in the water. The small ratio of guides to passengers eased my concerns about snorkeling in the open sea, forty-five minutes to an hour off the coast of Cancun. It'd been a bumpy ride out to sea, with the boat's hull smacking up and down against the five to six-foot waves. I took some comfort in the assurance that the seas were calmer on this day than earlier in the week, but maybe the guides tell that to everyone to help ease their anxieties. Whale shark season in Cancun runs from mid-May through September, with the whales passing by Mexico's Yucatan Peninsula in their migratory search for food. Despite their ominous name, teeth, and size (up to 40 feet in length, weighing an average of 20 tons), whale sharks feed on mostly plankton and small fish. They simply open their giant mouths, which span the width of their heads, and filter the nutrients out of the water. They have poor eyesight, as is the case with most sharks. Earlier, we'd been instructed to stay put if we saw a whale shark coming directly toward us in the water, because they'd sense us (not see us), and either turn or dive. To my surprise, the whale sharks do a lot of their feeding near the water's surface, which is what makes snorkeling with them so easy. I'd anticipated we'd be looking down on them, but that wasn't the case at all. Not only could we see them from the boat, we had to turn our heads upward in the water to see them cruising around. Most of the other passengers on my boat were divers, I could tell. And it wasn't just the underwater cameras, and GoPro's strapped to people's heads. Those who didn't bring their own wetsuits and snorkel gear rented wetsuits from the tour company at the marina before we left. Wearing a wetsuit not only ensures sun protection, but it also allows you to do your snorkeling without a life vest (as the suits provide buoyancy). I skipped the wetsuit to save money ($12), but ended up with a bad sunburn by the end of the day. As I waited my turn, seasickness crept into my conscience. I wasn't the only one, either. A German diver on our boat also began feeling ill.
Another woman on board was kind enough to offer me a motion sickness tablet, which I readily consumed, along with a bottle of water (included on the tour). The guide recommended I get back in the water because I'd feel better, but I resisted at first, and allowed others to go in my place. But time was running out, and I couldn't ignore how excited the others were every time they exited the water after snorkeling with the whale sharks. Familiar with the process now, I readied myself on the side of the boat, and waited for the guide's signal. My second time in the water, I got a much clearer view of the massive whale shark swimming before me. It was so beautiful, I forgot to swim. I was content to tread water, and watch it pass before my eyes, as if in a trance. The sunlight reflecting off the white dots across its body. The guide snapped me out of the moment with instructions to swim, but it was too late. The whale shark had gotten too far ahead of me, and because they swim against the current, it's not easy to catch up. Later, the guide had a good laugh at my expense, joking that I'm suppose to actually SWIM with them. My nausea began to abate once the boat was moving again. Our destination was Playa Norte, off the northern coast of Isla Mujeres, where we'd stop for lunch. 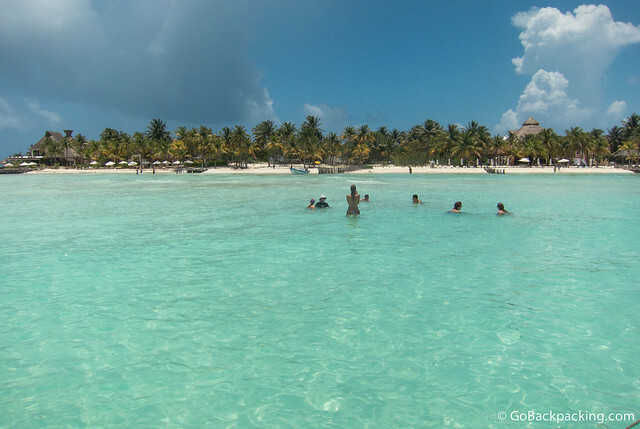 A bumpy forty-five minute ride later, we eased our way into the gorgeous, shallow waters off the palm tree-lined Playa Norte. The stunning scenery was a surprise, the calm waters, a welcome respite from the waves of the open sea. I sprayed on a new layer of sunscreen, and gently hopped off the boat, my feet sinking into the soft white sand. Boats from other companies were anchored around us, but the beach was empty. Wading through the warm waters, I imagined the scene during Christmas break in December, or Spring Break in March. I preferred to have the beach to myself. On board the boat, our crew began preparing fresh shrimp ceviche for lunch. It was tangy and delicious, the perfect end to our whale shark adventure in Cancun. Get Your Guide's whale shark tour in Cancun offers hotel pick-up from Cancun, Playa del Carmen, and Tulum. 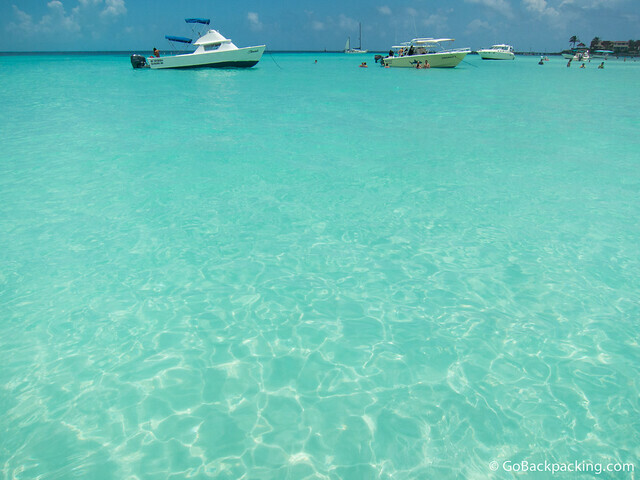 The further you are from Cancun, the earlier you need to wake up, and the later you get back. Bring lots of sunscreen, sunglasses, a hat, and waterproof camera. I regretted not buying a disposable camera for $20, as the water is clear and you're close enough to the whale sharks to get decent photos. Rent a wetsuit for further sun protection, don't depend on the life jacket, as it doesn't provide full coverage. Take motion sickness pills even if you don't normally get motion sick. You don't want a little nausea to ruin your experience. Plenty of bottled water, and a nice lunch are included, but bring extra water and snacks if you want. It's better to eat something than depart on an empty stomach. I was provided with a complimentary tour in partnership with GetYourGuide. Great post. This is definitely something high up on my priority list. Looks like an amazing experience. Excellent tip about the motion sickness. When I recently did a Great White cage dive in South Africa about 1/2 the people on board got sick. The first time I went to do the cage diving in South Africa, the boat never left the harbor as the waters were too rough. The next day it’d calmed down, and we went out. The boat rocked a lot after it stopped, but I think because it was a shorter overall time in it, I didn’t get seasick that time. Do they use spotter planes (like they do off the Ningaloo Reef in Exmouth, Australia) to guarantee the sightings? They said they go out to the same area they saw the whale sharks the day before, and look for them from the boats. By the time our boat made it to the whales, there were already a dozen or so there. I think all the boats communicate, so once one boat finds them, the others quickly congregate in the same area. I felt a little bad for the whale sharks in that respect, having so many boats descend upon them every morning, but they didn’t seem agitated or anxious. If they constantly return to the same areas every year, maybe they’ve grown use to the attention. Good to know. I’ve been dying to see one of these! Might have to make the trip down to the Yucatan. Thanks for the review. Hi Dave, this is a very good experience to swim with whale shark, I hope u had fun with them. I’m from Malaysia and used to dive in several island within the country, had no luck with such encounter yet:) did you visited malaysia before for island vacation? Thanks for reading. No, I haven’t been to Malaysia yet. I never knew a part of Mexico was known for whale shark sightings. It must have been common only lately since the whale sharks seem to be shy (turning and diving) while those in the Philippines are already like dolphins — they sometimes interact with people. Sounds like an amazing experience. I would love to swim with whale sharks. Super jealous! They’re fascinating to see under the water, with the light reflecting off the little white dots on their skin.